Hokkaido is the Shangri-la for Seafood lovers. Tourists from all over Japan and overseas visit this island on a food jaunt to enjoy what many claim to be the best seafood in the world. The cold sea surrounding Hokkaido is filled with abundant supply of nutritious planktons that serves as an excellent habitat for high quality and delectable seafood. Use this Hokkaido seafood guide to make sure you don`t miss out on these delicacies while you are exploring in the northern part of Japan. Hokkaido has many options for seafood lovers. You can find most of them in Sapporo by heading to the restaurants alongside the local fish markets. Nijo Fish Market (about 500 meters walk from Subway Bus Center Mae Station on Tozai line) and the Sapporo Curb Market ( about 700 meters walk from Subway Nijyuyonken Station on Tozai line) are both very close the city centre and also easily accessible. Kegani or horse hair crab (most common in Hokkaido) best season is from April – August and November – December. King crab or Tarabagani (most expensive) best season is from September -January. Zuwaigani or Snow crab (most delicious) best season is from November to March. Hanasaki Crab or Hanasakigani best season is from August to October. In Hokkaido, you can go on a crab spree at any small restaurants close to the local fish markets or at seasonal events held at various locations through out the island all around autumn. You can also make a reservation at the Sapporokanihonke Sapporoekimaehonten (about 2 minutes walk from JR Sapporo Station) and enjoy a delicious crab feast in a more relaxed environment. Uni is one of the top three seafood delicacies in Japan. Out of the hundreds of varieties of Sea urchin apparently only 6 are edible. Uni might not suit everyone`s palate, but if you have not tried it yet then you maybe missing a lot . When eating it fresh, you can smell the ocean and get a rich taste with creamy texture on your taste buds. There is nothing better than a fresh Uni Donburi (sea urchin topped on a bowl of cooked rice with soya sauce). Shakotan bordering the Ishikari bay in Hokkaido boasts to have the finest quality of Uni. It`s about two hours drive from Sapporo and is the mecca for Uni lovers in Hokkaido. The restaurant Oshokujidokoro Misaki run by a family of fishermen is a popular one among the locals. 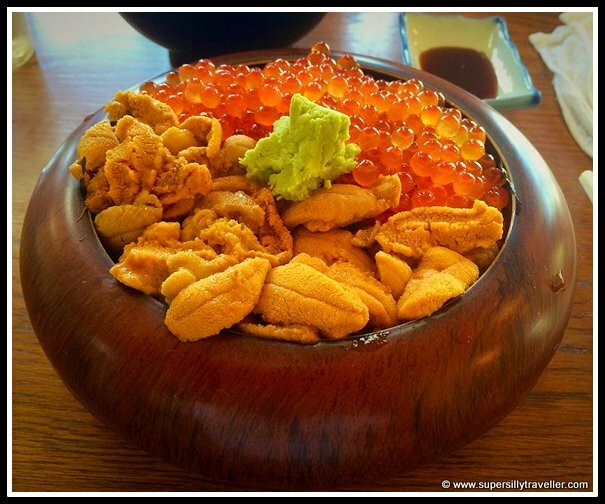 During the Uni season from Mid June to August they have a special limited all Uni Donburi. 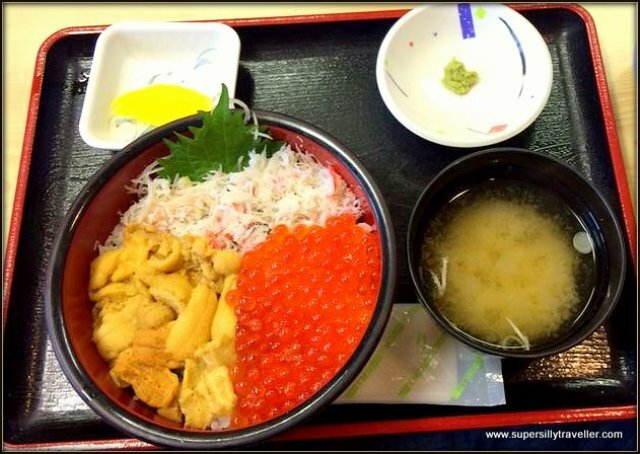 To savor on this delicacy arrive before 9:00 am at Oshokujidokoro Misaki during the Uni season. Hokkaido Squids (Ika) are well known in Japan and Hakodate a.k.a Squid City is the source of pride for Hokkaido. You can gorge on squids in various forms however, one of the most interesting and the creepiest way to eat it is in the form of Odori-don. When the bowl of Odori-don arrives on your table just pour some soy sauce on the deceased squid. The squid will start dancing 😯 as the muscles reacts to the sodium in the soya sauce. It looks quite scary to me but if are into Sashimi then this is going to taste good too. There are many restaurants in Hakodate where you can enjoy a dancing squid or a Squid Sashimi. The best place to enjoy Squids in Hakodate is at the morning fish market or if you feel really adventurous then head to Ikka-Tei Tabiji to eat the dancing squid. Check this video to know what you would be getting into when you order a bowl of Odori-Don . Hokkaido`s Sushi and Sashimi are quite unbeatable in Japan, thanks to the of availability of an exceptional quality of seafood. Otaru is the favorite place for all sushi and sashimi addicts in Hokkaido. There are various Sushi shops in Otaru but Ise Sushi and Sawasaikisuisan Kaisenshokudo are definitely one of more prominent ones. You can also take a walk around the Sushiya-dori about 15 minutes walk from the JR Otaru Station and pop into any of the Sushi restaurants that might suit you. If you would like to enjoy Sushi trains in Sapporo then Hanamaru on the 6th floor at the Stellar Place JR Sapporo Station is a good and budget friendly option. Be prepared to wait as this place is very busy through out the day. Salmon in Hokkaido, tastes incredibly delicious in any form be it Sashimi or grilled or in the form of a local fishermen dish Chan Chan Yaki. For a fisher, apart from a fresh catch of fat Salmons, the most prized possession is the Salmon roe or Red Caviar. Ikura don is a common way to relish on Salmon roe, combine that with Uni and you will be on a gastronomical delight. Hokkaido`s Ikura is well known to draw high value at the Tokyo Tsukiji market.
. Click to know our first experience of Salmon fishing in Hokkaido. Hokkaido Scallops are world renowned for their high quality and freshness. They feed off on the warm Kuroshio and the cold Oyashio oceanic currents that creates a unique environment perfect for producing the finest quality of Scall0ps in the world. 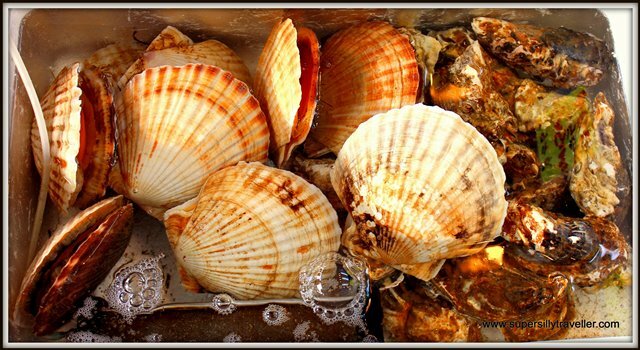 The best season to eat Scallops is in Winter i.e from December to February. Delicious Yaki (grilled) Hotote or a Scallop Sashimi can be enjoyed at any of the local restaurants serving seafood in Hokkaido. 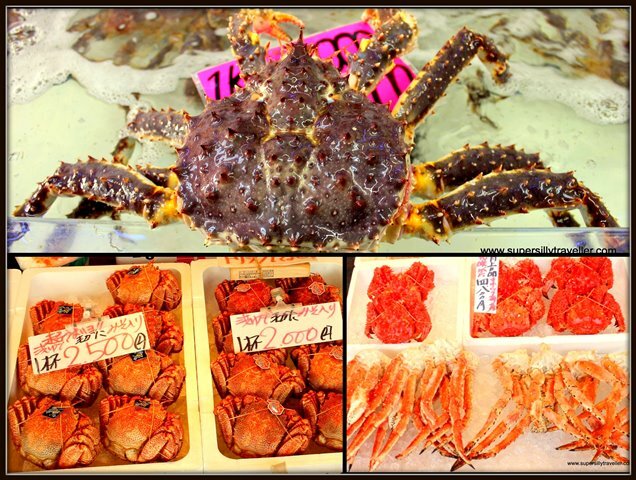 Click here to peek at some of the snapshots I took at a local fish market in Sapporo. The Ika Dori Don certainly looks interesting. I heard from a couple people who visited Ikkatei Tabiji that the squid was a little tough and bland because they’ve been hanging out in the tanks too long. Either way, I’ve been interested ever since I saw some videos on Facebook! My father is originally from New Orleans, so even just seeing Hakodate seafood dishes makes me want to do backflips! Oh man… I’m getting hungry 😛 I better go now! Stumbled upon your interesting and informative blog as I was searching the Internet for info on Hokkaido. My friends and I will be visiting Hokkaido in 2 weeks time. Thanks for your kind words 🙂 I hope you have a good trip. Let me know if you had fun. Which is your favourite restaurant for crabs? I will be in Sapporo the last week in October. Also please advise where you prefer to go for the best tasting crab. thank you!